When Into the Gloss first announced their venture into making their own cosmetics, I immediately knew I needed to get my hands on it. For those of you who don't know, Into the Gloss is a beauty site that was started by the stunningly gorgeous Emily Weiss back in 2010 and has grown to be one of the single most popular beauty websites out there. For many beauty lovers (myself included) the site is a beauty-bible, bringing in an average of 10 million visitors a month. One of my favorite series the site offers is The Top Shelf, posts that take a personal look into the cosmetic collections of some really awesome women. I have discovered tons of new products through the series (and the site in general) and always know that it will recommend the best of the best to its readers. Knowing this, I was pretty darn confident that their debut beauty line, Glossier, would be full of hits. I was kindly sent the brand's Phase 1 Set* to try out for myself, and after a few weeks of trialling I'm ready to tell you all about it. The brand's mission statement is "beauty in real life", and the products they've made so far are all about enhancing your natural beauty instead of covering it up. The Phase 1 set includes a moisturizer, face mist, skin balm and skin tint, the perfect combination of products to treat your skin to a healthy, natural glow. When I'm using the products, I always start with their Soothing Face Mist*, a spray infused with rose and aloe that can refresh the skin during the day and also works to prepare it for moisturizer. I'll admit that I've never actually owned a facial spray before and so I wasn't so sure what to think of this guy at first. Compared to the other products, this is not the standout one to me. That said, I do really love it for freshening up my skin during the day - I love that I can spritz it over makeup without having to worry about it messing anything up. It just leaves behind a nice, subtle glow so that my face doesn't look so dull or worn down. After I spray a bit of the Face Mist on my skin, I then follow up with the amazing Priming Moisturizer*. This was hands down one of my favorite products in the set, as well as one of my new all-time favorite moisturizers. I don't know about you guys, but recently I've had a real problem with finding a moisturizer that doesn't pill and rub off when applied underneath makeup. Perhaps it's just my skin, or maybe I'm awful at picking out moisturizers, but I have found that this one works like a dream. It has a rather liquid-y consistency for a moisturizer but leaves behind wonderfully hydrated skin without any layer of grime left behind. It can even be layered if you require more hydration - something I almost always do. I love this moisturizer so much that it's all I wear on my no-makeup days - it just leaves my skin simply glowing. That said, it's an aptly named product and does work wonderfully as a makeup primer. No matter what foundation you put on top of it, your skin will look plumper and healthier than before. It does work quite wonderfully, though, with Glossier's Skin Tint* (which I own in the shade Light). This sheer coverage formula is one that I would compare to the likes of Sunday Riley's Tinted Primer or MAC's Face and Body Foundation (which would make sense since MAC's former director of Product Development helped in the making of Glossier). Like these two similar formulas, it provides almost imperceptible coverage that you can barely tell is there unless looking at a side-by-side comparison. It won't cover acne, or even much redness, but on no-makeup makeup days you could not find a better formula than this. It just adds that hint of color and dewiness that looks like your skin but better. Finally, there's my favorite of the bunch - the Balm Dotcom*. This is a product that I can guarantee I will never be without again. Described as an all-purpose skin salve, this little gem has an almost Vaseline-like clear formula that can be used to hydrate any and all dry skin. I personally have been using it daily on my permanently dry lips, and I am happy to report it is the first product that has ever made any difference to my dry, cracked lips. I slather it on in the morning and afternoon and am usually set throughout the day (in comparison to my lip balm that required hourly reapplication). The formula is thick but not unsightly, and sinks right into my lips, leaving them looking plumper and healthier than they ever have before. And it really is an all-purpose product as well, as I've even found use for it as an in-a-pinch luminizer. I apply just a teeny bit of this along my cheekbones and am left with a dewy, luminous looking highlight (and one that I needn't worry about causing any breakouts). While I know the tube will last me for some time, I already plan on stocking up on this guy so that it will always have a place in my makeup bag. Along with the set of incredible products, I also received some lovely stickers that can be used to personalize the packaging (which, as you can see from the photos, I took full advantage of). 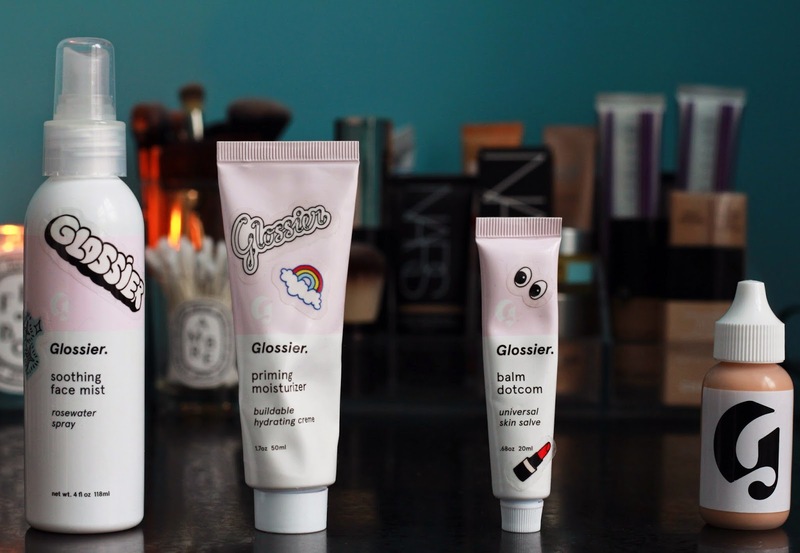 The stickers were a really adorable and unique way to make these products your own, and I felt they really fit the overall theme Glossier is going for. Just this past week, the brand also released two new additions to the line in the forms of two face masks. The Mega Greens Galaxy Pack is a mask meant for decongesting and detoxifying your skin, while the Moisturizing Moon Mask is best for hydrating and brightening dry, dull skin. If Glossier's Phase 1 Set is any indication, these two masks are going to be incredible. I cannot wait to get my hands on them and try them out and, honestly, I cannot wait to see what the brand has in store for the future. Glossier is one to look out for, folks.